Recently McKinlay Kidd celebrated a very significant milestone – our 15th anniversary of seeking out locations, activities and accommodation that allow our customers to see Britain and Ireland differently. Our founders, Robert Kidd and Heather McKinlay, sat down to reflect on the journey so far. Why did you decide to start McKinlay Kidd? Robert – I’ve been asked this question a lot, and I give a different answer every time! It all traces back to when Heather and I first met, working for a large tour operator. By that point we had both been bitten by the travel bug – it really is the most exciting industry to be part of because you are selling unforgettable experiences to people. We always knew we wanted to run our own hospitality business and we had a really in-depth understanding of good tour operating practise. A redundancy package in 2003 gave us the opportunity to really go for it. Heather – We always loved travelling and suggesting hidden gems and quirky places to go to our friends. The original idea was to help people experience Scotland differently, the way we have always loved to ourselves. What have been your personal highlights of the last 15 years? Heather – (Laughs) There have been far too many to mention! For me, the feeling when you discover somewhere great to stay is special. I’ll always remember a trip one February. First, we went to an incredibly remote part of Scotland called the Knoydart Peninsula, cut off from the main UK road network. We took a boat over with a walking guide and ended up scrambling 500m up in snow and ice before heading back to our cottage for the evening – only to find that it was freezing inside as well as outside! We ended up having a fantastic night around the fire and impromptu ceilidh with some other visitors but later I could hardly sleep at all as it was so bitter cold. 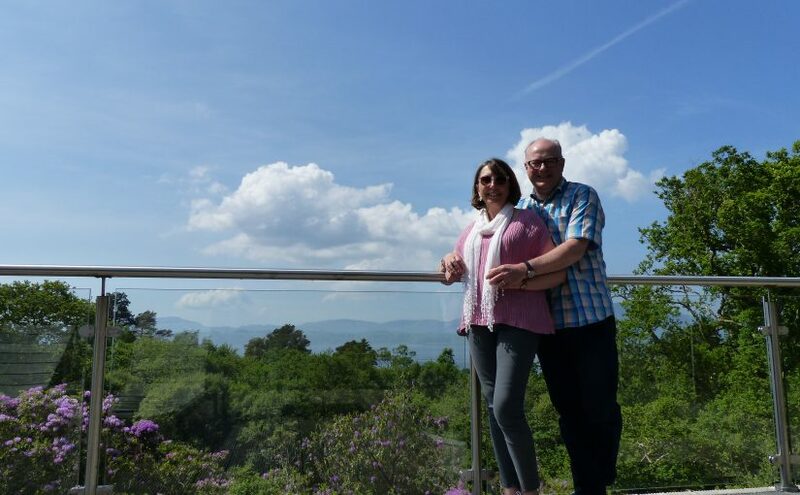 Then – as a total contrast – we spent the next night at the luxurious Isle of Eriska, a five star hotel on a private island. I’ll never forget unwinding – and thawing out – in a hot tub under the stars. Robert – I love sending people to places we feel passionately about, empty beaches and little corners you’ve never heard of. We’ve also met some wonderful people over the years, both customers and business partners, who we now count as friends. But I suppose my personal highlight is the fact I am sending so many customers on holiday to Northern Ireland. As a child of the Troubles, having the opportunity to send people to my favourite parts of my beautiful home country is an amazing feeling – I still get a thrill every time we get a Northern Ireland booking. How do you choose where to offer to customers? Heather – We want people to get to places they may never have thought of before. When Robert suggested creating holidays to Shetland, I wasn’t at all convinced. Thank goodness he changed my mind – it has become one of our most beloved and popular destinations! So we always try to look at things a little differently. Robert – When we first sent people to the Isle of Skye without cars, I was told we were crazy. But the reality was that people wanted to go! A huge part of choosing our destinations relies on finding people in the area who share our outlook and vision – a taxi driver who can become a private tour guide, for example. As a result, we have built very strong relationships with local business partners over the years. What is your favourite destination that McKinlay Kidd offer? Heather – It changes all the time! Heather – You’ve just said everywhere is your favourite! Robert –The list never ends! I suppose the best way to show our favourite destinations is actually through our new 15th anniversary holiday. Heather and I sat down with our Product Manager Chris for a few hours one day and brainstormed all of our favourite destinations and activities. We then drew these highlights together in a way that would make the trip the most enjoyable for our customers, and I have to say that I think we have succeeded. Heather – I love places that are a bit out of the way. 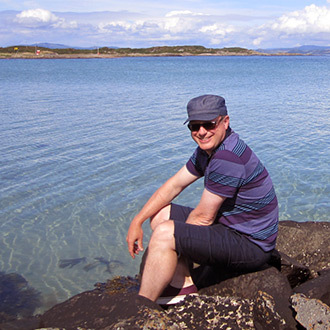 The Isle of Gigha in particular – my Dad is from that area and I remember writing a school project years ago about a trip to the island after a family holiday in Kintyre. Now we make a point of trying to go there once a year to sample their delicious seafood – Chris (one of McKinlay Kidd’s sales advisors) went recently and it has made us long to re-visit soon! Equally, though, I love going back to London. I grew up on the outskirts so I always get a thrill walking those familiar streets, no matter how busy. What is the most important lesson you have learned in these 15 years of McKinlay Kidd? Robert – The most important thing to us will always be our relationship with our customers. People on holiday want to have a great time, so we make sure we are with them every step of the way to offer help if it is needed. There will always be challenges – particularly from the weather in this part of the world – but we can always learn from the experience and change things for the future. Heather – For me it is definitely to never stop trying new things. This is the foundation of the company – we weren’t following anyone else’s model when we started the business. The first time we really had to adapt was a few years in, when the economy was in a downturn. We made the decision to purchase a Jaguar E-Type to help promote our classic car trips – we had been renting until that point – and this was really successful for us the following year. We only kept the car for a couple of years, but it opened up possibilities for us. Now we offer holidays touring in a Tesla, for example. Robert – We were the first company to do a lot of things; to offer classic car touring packages, whale-watching holidays to the Isle of Mull, to send people to three different islands on one holiday, to offer independent train touring in Scotland…the list goes on. Finally, what are your plans for the next 15 years of McKinlay Kidd? Heather – (Laughs) That’s a difficult question! The world is constantly changing – smartphones didn’t exist 15 years ago for example. I want to make sure we stay true to our values. We want to grow, but we never want to lose sight of our vision as a small company that offers real personalised service to every single customer. The more technology evolves, the more personal contact will leave other businesses – so this is more important to us than ever, as it sets us apart from the crowd. Robert – I would say that I hope we aren’t that different in 15 years. We will offer different products, experiences and potentially some destinations outside the UK & Ireland, I don’t know. But like Heather, I want our values to remain the same, in terms of team dynamic and the services we offer. McKinlay Kidd is built on personal contact with our staff, so while technology will be helpful, people to people interaction will still be our main focus. I’m very happy with how things are, so in a way I don’t want things to change too much…though, of course, they probably will. Hartelijk gefeliciteerd! Is alweer zo lang geleden dat jullie in Amsterdam woonden! Well done guys. You spotted a gap in the market and well and truly filled it. Hope McKinlay Kidd continues to go from strength to strength. We are always seeking holidays in places we’ve never been. However, following two wonderful McKinlay Kidd tailor-made visits to Scotland, we are hoping to arrange a third.